This is the day of Pentecost, when THE HOLY SPIRIT was first sent to the Apostles. Notice that when the Apostles spoke in Tongues, everyone who heard them speak, heard it in their own language wherein they were born. Notice that when the Apostle began to speak, THE HOLY SPIRIT fell on those present, as it did for the Apostles 'AT THE BEGINNING'. When was the beginning? It was Pentecost day! And how did the Tongues manifest? Every man heard them in his own language wherein he was born. Everyone understood what was being said. If you take a look at verse 11:17 below, you will also see that GOD gave them the 'like gift' as HE did unto the Apostles. So, the 'like gift' would mean the same gift and is like their gift. Read the verses below and notice verses 46 and 47. In verse 46, they spoke with Tongues and magnified GOD. And in verse 47, what does Peter say? He says they received THE HOLY SPIRIT 'as well as we'. What does 'as well as we' mean? It means that it's the same as Peter and the other Apostles. And how did Peter and the other Apostles receive THE HOLY SPIRIT? Well, it's written above. They received THE HOLY SPIRIT on Pentecost day and they all spoke in Tongues and everyone who heard them speak, heard them speak in their own language wherein they were born. What does it mean when THE HOLY SPIRIT prays? If you read the verses below in context, you will see that GOD'S WORD says that HIS Elect do not know what to pray for, therefore THE SPIRIT makes intercession for the Elect. Another thing to notice about Romans 8:26 is that the SPIRIT itself maketh intercession for us with 'groanings'. The definition of 'groanings' is to 'sigh'. A sigh is basically inaudible. From G4727 ; a sigh: - groaning. From G4728 ; to make (intransitively be) in straits, that is, (by implication) to sigh, murmur, pray inaudibly: - with grief, groan, grudge, sigh. The SPIRIT itself maketh intercession for us with groanings 'which cannot be uttered'. If you take a look at the definition for 'cannot be uttered', you will notice that it means 'unspeakable'. Therefore, no words are spoken. From G1 (as a negative particle) and a derivative of G2980; unspeakable: - unutterable, which cannot be uttered. First Corinthians chapter 14 is about order in the church. It details the use of Tongues and Prophecy. The following verses refer to speaking in Tongues. These are the only verses in The Bible that refer to speaking in an 'unknown' Tongue. If you look in your King James Bible, you will see that the word 'unknown' is in italics. Whenever you find a word in the King James Bible written in italics, it means that the word was added by the translators to make the verse flow more smoothly for the English reader. If you look at the Greek definition for 'Tongue', you will see that it means a language naturally unacquired. This is the same word used in Acts 2:4. The situation going on in Corinth at this time was that the church was not disciplined. People were speaking with other languages which were unknown to others around them and there were no translators present. Since Tongues and Prophecy were under the control of the person possessing the gift, it resulted in an undisciplined display of activity in the church. Paul's message to the church was to do things in an orderly fashion. Even though the people were speaking mysteries in the Spirit, only GOD would understand because there was no one else around to hear it in the language spoken. It's the same word for TongueG1100 as used in Acts 2:4 but a different result because the people were speaking a language which was not known by those in attendance. Paul tells the church that he would rather speak five words in a language understood by the hearer so that he can teach rather than ten thousand words which aren't understood. Paul states that speaking in a language not understood by the person receiving it makes you a barbarian to the person receiving it and the person receiving it is a barbarian unto you. So the subject of this chapter is discipline, or order in the church. Of uncertain affinity; the tongue; by implication a language (specifically one naturally unacquired): - tongue. 1st Corinthians 14:2 For he that speaketh in an unknown tongue speaketh not unto men, but unto God: for no man understandeth him; howbeit in the spirit he speaketh mysteries. 1st Corinthians 14:4 He that speaketh in an unknown tongue edifieth himself; but he that prophesieth edifieth the church. 1st Corinthians 14:13 Wherefore let him that speaketh in an unknown tongue pray that he may interpret. 1st Corinthians 14:14 For if I pray in an unknown tongue, my spirit prayeth, but my understanding is unfruitful. 1st Corinthians 14:19 Yet in the church I had rather speak five words with my understanding, that by my voice I might teach others also, than ten thousand words in an unknown tongue. 1st Corinthians 14:27 If any man speak in an unknown tongue, let it be by two, or at the most by three, and that by course; and let one interpret. 1st Corinthians 14:10 There are, it may be, so many kinds of voices in the world, and none of them is without signification. From G1 (as a negative particle) and G5456; voiceless, that is, mute (by nature or choice); figuratively unmeaning: - dumb, without signification. 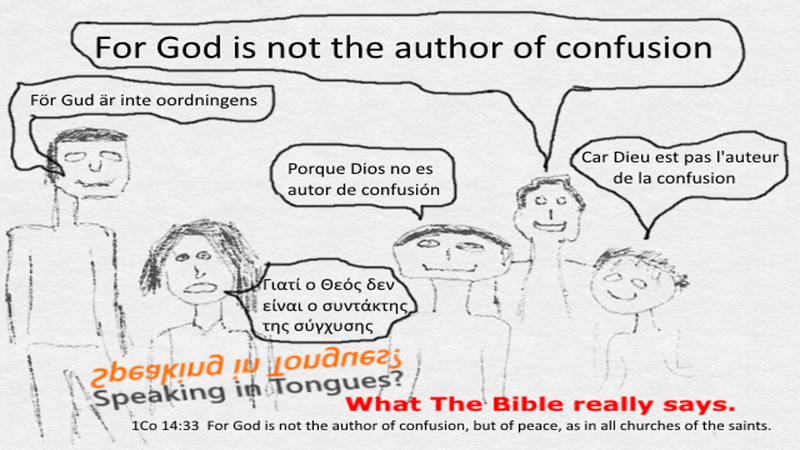 1st Corinthians 14:33 For God is not the author of confusion, but of peace, as in all churches of the saints. If you read Acts 2 and the book of Joel, you will see that this is what happens at the end time when the Elect are delivered up and THE HOLY SPIRIT Speaks through them as described in Mark 13. 1st Corinthians 13:8 Charity never faileth: but whether there be prophecies, they shall fail; whether there be tongues, they shall cease; whether there be knowledge, it shall vanish away. 1st Corinthians 13:9 For we know in part, and we prophesy in part. 1st Corinthians 13:10 But when that which is perfect is come, then that which is in part shall be done away. 1st Corinthians 13:11 When I was a child, I spake as a child, I understood as a child, I thought as a child: but when I became a man, I put away childish things. 1st Corinthians 13:12 For now we see through a glass, darkly; but then face to face: now I know in part; but then shall I know even as also I am known. 1st Corinthians 13:13 And now abideth faith, hope, charity, these three; but the greatest of these is charity. GOD'S Elect first trusted in CHRIST. When? Before the foundation of the world. 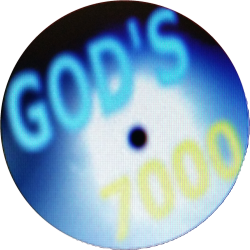 GOD'S elect stood with GOD at the overthrow of satan in the last age. The First will be last: They will be in the last generation of this age to stand with GOD again.